NETWORK UPDATE: The season finale of THE BLACKLIST gained 0.1 in final numbers. However, the REIGN season finale, along with the night’s SVU rerun, each lost 0.1. CABLE HIGHLIGHTS: ESPN’s NBA PLAYOFFS doubleheader topped everything on network TV last night, even on an evening of high-profile season finales, with 2.64 for the Cleveland/Chicago game, and 2.43 for Clippers/Rockets. The top non-sports telecast was LIP SYNC BATTLE (Spike), up 0.11 from last week to 0.77. GIRL MEETS WORLD (Disney) climbed 0.13 from Wednesday’s episode to 0.67. Syfy’s WWE show was down 0.04 to 0.62. A 1-hour PAWN STARS (History) at 0.56 was down slightly from last week’s 0.60/0.58 for 2 half-hours, and LOST IN TRANSMISSION gained 0.06 to 0.42. A&E’s THE FIRST 48 was up 0.02. 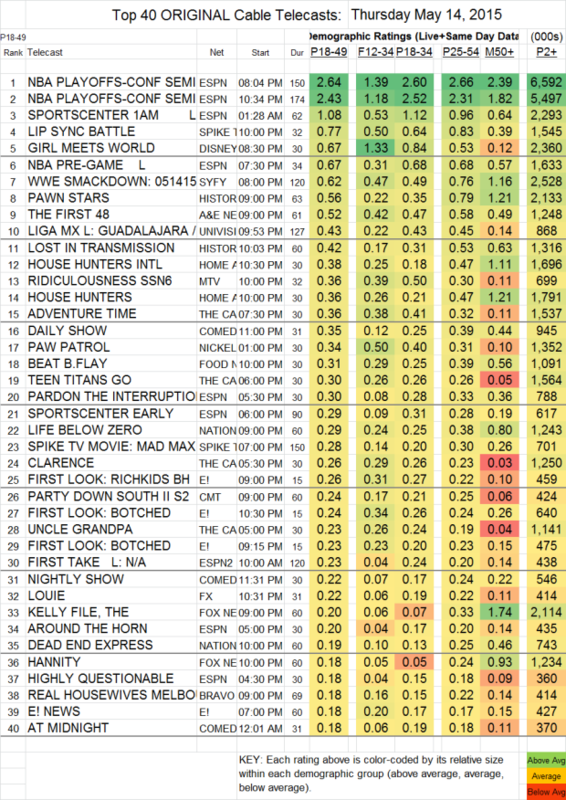 RIDICULOUSNESS (MTV) slipped 0.02 to 0.36. On FX, LOUIE climbed 0.05 to 0.22, while THE COMEDIANS fell 0.06 to 0.14. REAL HOUSEWIVES OF MELBOURNE (Bravo) grew by 0.06 to 0.18. Note: although it doesn’t appear on the chart, the 4AM FISHCENTER on Adult Swim was at 0.37, with 744K total viewers. Among the micro-rated, IT TAKES A CHURCH (GSN) fell 0.02 to 0.02, although it was up in total viewers to 209K.